WHAT DO YOU DO/PLAY: Singer-songwriter, play acoustic guitar and bass. HOW LONG HAVE YOU BEEN TOGETHER AS A BAND? : Since school, so 3 years, but 2 years as Elephant Trees. GIVE US THREE REASONS WHY WE SHOULD TRACK DOWN, LISTEN AND DISCOVER YOUR MUSIC? We love what we do and it shows. 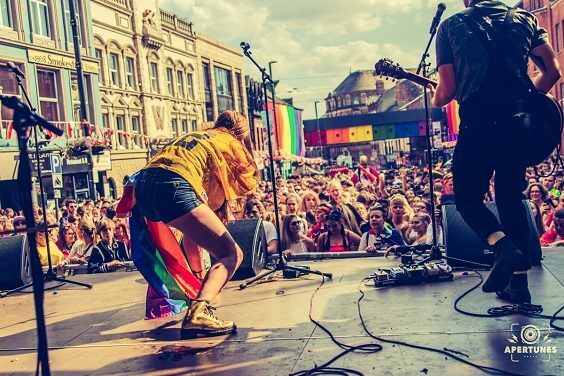 We are trying to increase visibility of female musicians and the queer community. We sing about mental health and being different and all that being okay. So come join us if you always feel like the outsider looking in…surprise, we all feel like that sometimes. RECORD? How To Be A Human Being by Glass Animals. CD? Westlife’s ﬁrst album . DOWNLOAD? Bruno Mars, Do-wops and Hooligans. SO, WHEN IT ALL GOES RIGHT AND YOU’VE GOT A MANSION AND A SUPERMODEL GIRL/ BOYFRIEND, WHAT WILL BE YOUR BIGGEST MUSICAL INDULGENCE? I’d love a grand piano, but generally a room in that mansion with every instrument I’d ever need inside. NOTHING. ITS RIDE OR DIE! (Or disappear travelling). Pop punk. Sam (guitarist) and Natasha (our Manager) love pop punk. I do not… cut to playlist wars on the road. Annie Clarke (St. Vincent) on vocals, Alex Robertshaw (Everything Everything) on guitar, Thom Sonny Green (Alt-J) on drums, Este Haim (Haim) on bass. GO SEE THIS FILM: High School Musical 1, 2 and 3. GO READ THIS BOOK: Lexicon by Max Barry. GREAT LOST BAND/ARTIST: Low Island. WOULDN’T BE CAUGHT DEAD SUPPORTING: A gig’s a gig. I wouldn’t turn much down. LONDON, L.A OR LEEDS? : LEEDS LEEDS LEEDS. Ok, obviously, LA. Life is too short to live for a pay cheque. You can see Elephant Trees live, supporting Larkins at the Brudenell Social Club on the 28th Feb and you can hear their new single ‘4100’ from the 15th Feb.